This tutorial explains how to calculate rank for one or more numeric variables with PROC RANK. In SAS, there are multiple ways to calculate rank overall or by a grouping variable. In data step, it can be done via retain statement. SAS made it easy to compute rank with PROC RANK. Compute rank of numeric variable - "Score"
The OUT option is used to store output of the rank procedure. By default, it calculates rank in ascending order. Suppose you need to assign the largest value of a variable as rank 1 and the last rank to the lowest value. The descending keyword tells SAS to sort the data in descending order and assign rank to the variable accordingly. Suppose you need to split the variable into four parts, you can use the groups option in PROC RANK. It means you are telling SAS to assign only 4 ranks to a variable. GROUPS=4 for quartile ranks, and GROUPS=10 for decile ranks, GROUPS = 100 for percentile ranks. Suppose you need to calculate rank by a grouping variable. To accomplish this task, you can use the by statement in proc rank. It is required to sort the data before using by statement. Let's create a sample dataset. 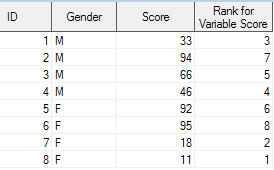 See the variable score having same values (33 appearing twice). Specify option TIES = HIGH | LOW | MEAN | DENSE in PROC RANK. LOW - assigns the smallest of the corresponding ranks. HIGH - assigns the largest of the corresponding ranks. MEAN - assigns the mean of the corresponding ranks (Default Option). 10 Responses to "SAS : PROC RANK"
Please add predictive modelling steps...step by step. I didn't get the concept of ties that you have explained in the last! Thank you for your feedback. I have added more description to the concept of ties. Hope it helps. Nice explanation... keep going guys.. Thanks!! How can I get the cuts of deciles along with ranks and frequency as provided by proc rank? Can you please the proc rank concept along with proc sql?